Our family-run commercial cleaning business has been using good old-fashioned elbow grease and that all-important personal touch to keep the windows of Cardiff and South Wales gleaming for over 30 years. We’re trusted throughout the Vale and beyond to provide first class cleaning services to companies of all sizes – no job is too big or too small for our professional team of window cleaners. We offer flexible and dependable window cleaning to clients with a wide range of requirements. From tight schedules to difficult-to-reach windows, we work with our clients to provide cleaning solutions which suit their premises and lifestyles. Crystal clear windows – We’ve perfected the art of pristine windows. Our window cleaners leave your surfaces sparkling, giving you a crystal clear view. Punctuality & reliability – From one-off appointments to regular scheduled slots, we pride ourselves on our punctuality and reliability, slotting seamlessly into your day. An “extra mile” service – We do more than wash and wipe. The Abbey Cleaning Service’s window cleaning team work hard to find ways to continually improve the service that you receive. You only need ask. Sparkling windows shouldn’t cost the earth, which is why our high quality window cleaning service won’t break the bank. We offer very competitive rates and up-front quotes with no hidden extras. Every quote that we provide includes materials, labour, admin and insurance, so you know exactly what you’re paying for, with no nasty surprises when you receive our invoice. 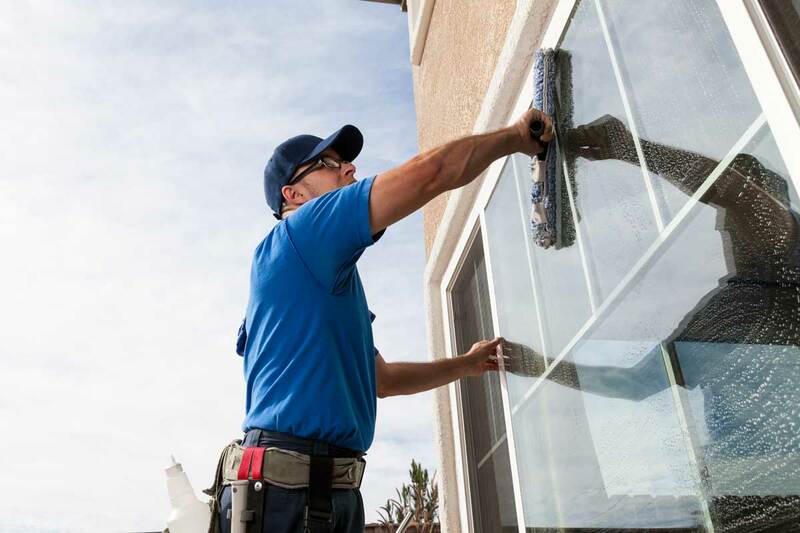 Contact our helpful team today to request a commercial window cleaning quote. For our regular commercial customers, we provide specific training to ensure that the window cleaners working on your premises understand your precise requirements. From safety protocols and timeframes, to quirks with your building and more unusual needs, we send a member of our management team to discuss your service with you before we get started. Once we’re familiar with your unique requirements, we’ll make a scheduled visit to your property to train our window cleaners in the specifics – all to offer you a flawless service every time. We work hard to make sure that every service we offer results in a flawless finish. We arrange regular spot checks with you so that we can keep on top of our performance and to ensure that you’re receiving truly pristine window cleaning from our team. We also take time to listen to your feedback, learning from your comments to continually improve what we do and how we clean. We may be Cardiff’s window cleaning experts, but we’re always ready to learn. We’d like to take a moment to introduce you to some of the individuals and businesses in Cardiff we’ve helped keep sparkling clean over the past 30 years with high quality window cleaning. Please view our testimonials to find out more about what The Abbey Cleaning Service has done for others. Enjoy pristine windows and a clearer view by arranging regular appointments with The Abbey Cleaning Service’s window cleaners. Call us today to discuss your precise requirements on 029 2067 9323. Contact us to find out more about our Window Cleaning Service.